Isuzu's commitment to your satisfaction didn't end when you left the dealership. 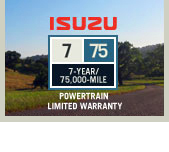 Isuzu's warranty coverage is a commitment to stand behind our vehicles. That's why our basic warranty is one of the best around -- covering you for 3 years or 50,000 miles with no deductible. Isuzu vehicles excel through scouring salt air, scorching desert heat and the most corrosive winter conditions. And to be sure, they're covered for 6 years or 100,000 miles against rust perforation. As reliable as Isuzu vehicles are, they can't do much about empty gas tanks or dead batteries. That's where roadside assistance comes in handy. Just call the toll-free number (800) 444-0303 and we're there ASAP. The Protection Plan extended service contract provides peace of mind when the Basic Limited Warranty expires, with low-cost coverage for up 100,000 miles. See your warranty information booklet for warranty details.